This is the incredible tale of a very odd boy. He always wanted what wasn't his: his friends' toys, his cousins' clothes, his parents' books...he ended up being so envious that even the hairs on his head were given to jealousy. One day, it just so happened that a hair on the crown of his head woke up completely green. Now, when the other hairs saw this they became so hugely envious that they too ended up turning green. The next day, a hair near his hairline was stained by something blue. Seeing this, again all the other hairs ended up blue. So, day after day, the boy's hair would completely change colour, driven by the boundless envy his hairs felt. 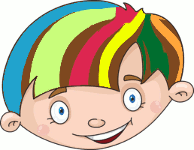 Everyone loved the boy's colourful and ever-changing hair; except the boy himself. He always wanted what other people had, so, of course, he wanted to have hair just like the others had. One day, this angered him so much that he furiously pulled at his hair. One rather thin hair couldn't endure all the pulling, and it let go; falling to the floor with quite a nice smooth flight. Of course, the other hairs saw this, felt envious, and they all let go too. Within a minute the boy was as bald as an egg, and the look of surprise on his face seemed like a bad joke. After many tears and tantrums, the boy understood how all this had happened, and how it had all been a natural consequence of his envy. He decided that, from then on, he would try to enjoy what he had, without becoming obsessed by what others had. Trying to put this into practice he started by making the most of his smooth, shiny, hairless head. He turned it into his own private canvas. From that day on, he took to painting beautiful, colourful scenes on his bald head. People enjoyed these so much that the boy finally developed into one of the world’s best - and certainly the world's most original - artists.